Topps is taking legal action against Leaf for copyright and trademark infringement, stemming from an advertisement for Leaf's 2011 Leaf Best of Baseball, a product that features repackaged cards that have been previously released. The sell sheet for the product pictures 11 professionally graded Topps cards, which is what the company is taking issue with. 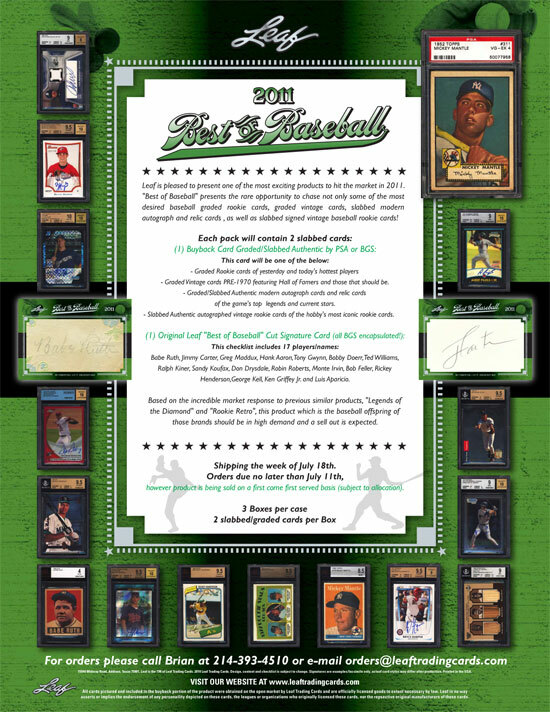 Topps argues that the cards on the sell sheet are, "highly celebrated and sought after by card collectors" and "a blatant attempt at capitalizing on Topps' goodwill and intellectual property to advertise and promote Leaf's product." Topps maintains that they have federally registered copyrights for a majority of the card images shown on the sell sheet, as well as registered trademarks on several brands listed including Bowman, Bowman Chrome and Topps Chrome. Additionally, Topps claims that they have licensed the exclusive rights to use the names, images and signatures for Mickey Mantle, Stephen Strasburg, Bryce Harper and Babe Ruth. According to the lawsuit, Topps "seeks an injunction prohibiting use of the Topps card images and trademarks, along with actual and punitive damages." As of this writing, the sell sheet in question is still listed on the Leaf website under the "products" tab. This reminds me of when we saw one card company (and I can’t remember which company on each side) were using autographs from other company’s cards to make cut signatures from. It’s an unfortunate example of the glaring lack of creativity and innovation amongst card manufacturers. Evan D. (ID 25026) � I believe that was Topps going after UD a couple years ago for SP Legendary Cuts.